The most common question I get about CBD is: “How much do I take”? CBD is a non-psychoactive component of cannabis that is extracted from CBD rich strains of marijuana such as the Charlotte’s Web strain. The safety profile and the ability of CBD to control pediatric epilepsy without psychoactive or other side effects catalyzed the medical marijuana movement. In the early 2000’s, families who could not get this medicine in their home states moved to Colorado, and the state is now a leader in research and production of CBD and other medical cannabis preparations. NuLeaf Naturals grow hemp in Colorado that to produce organic CBD oil that is standardized for potency and has near zero levels of THC. This post describes how to start yourself or your child on CBD, but before you undertake any new herbal medicine regimen you should consult a medical professional, preferably a naturopathic doctor. The CBD dosing regimen below is specifically for NuLeaf naturals products which you can purchase directly from the producer. NuLeaf CBD is standardized to a single formulation with a concentration of 50 milligrams of CBD per milliliter of oil. It is very simple to determine a dose for pediatric CBD use since NuLeaf publishes this important fact: 1 drop of their CBD oil contains 2.4 mg of CBD. See below how to give this to adults. A good starting point for general pediatric CBD dosing is to start with .5mg CBD per pound of body weight, split across 3 doses per day. For example, a thirty-pound toddler would take 2 drops, 3 times per day for starting dose of 15 mg CBD. 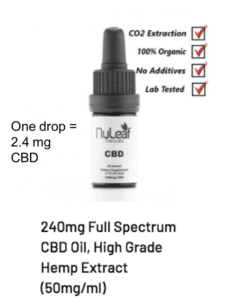 CBS is generally well tolerated but if you have concerns for sensitivity to CBD then start with just one drop (2.4 mg of NuLeaf Naturals CBD) the first time you administer CBD for pediatric use. Returning to the example of the 30-pound toddler, if no adverse effects are noted after two weeks of CBD therapy, I may advise to increase the therapeutic dose to 30 mg CBD daily, which is 4 drops 3X per day. This is a therapeutic dose that you can increase under medical supervision and in response to the therapeutic need. CBD has a stellar safety profile, but all cannabis products are biphasic which means they could have significant side effects at both very low or very high doses. Use of CBD to treat pediatric epilepsy could employ a 5-10X higher dose but this is obviously an extreme use case. Each condition I treat with CBD necessitates an individual prescription for the patient to achieve exact dose titration. Example: A 30-pound toddler is advised by their naturopathic doctor to take 15-30 mg of CBD per day, split over 3 doses and taken with food. Each drop yields 2.4 mg of CBD so it’s easy to ‘titrate’ the dose. A starting dose of CBD for adults is .5mg per pound of body weight. A140-pound adult should take 75 milligrams of CBD daily: take 1.5 ml of NuLeaf Naturals Full Spectrum CBD Oil split across 3 doses per day. There are about 5ml in a teaspoon, so best to take this via drops: 10 drops yield 24 mg CBD. If desired results are not obtained and the CBD is well tolerated, you can double the dose after one week and then wait two more weeks to measure results. 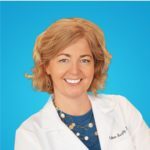 If you again have not achieved the desired results you can go as high as 2mg/pound/day under guidance of a doctor who is knowledgeable on CBD. Example: A 140-pound adult is advised to take 70 mg of CBD daily (.5mg of CBD per pound of body weight) split over 3 doses taken with food. It is important to know the exact amount of CBD and THC in any cannabis-based medicine you consume and understand how the CBD:THC ratio affects the medicine and its uses. NuLeaf Naturals is tested to have undetectable levels of THC. The only known contra-indication for CBD is to not take it with grapefruit as that combo could have negative impacts on enzymatic activity in the body. AFFILIATION: I make a commission when clicking through to purchase CBD . Thanks for your support! You don’t have to buy from me, but you should always buy from a reputable source with strong standards for purity and potency. Most CBD is an industrial byproduct from Chinese hemp production, it’s not good for you, know who you are buying from. Per FDA guidelines, this post does not constitute a recommendation to take CBD or cannabis products. Other formulations of CBD not discussed here include liposomal, nano-particle and homeopathic. Please reach out in the comments if you have questions on CBD. Hi. 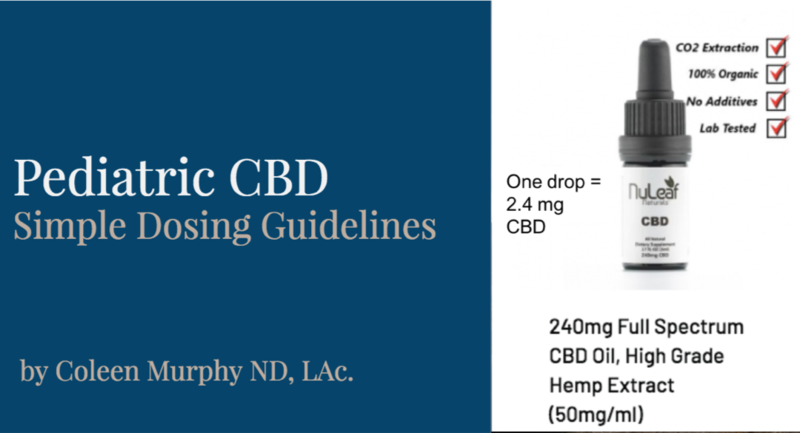 You write above “It is very simple to determine a dose for pediatric CBD use since NuLeaf publishes this important fact: 1 drop of their CBD oil contains 2.4 mg of CBD.” Don’t you mean “1 dropper (30 drops)”? 2.4mg/drop would be close to 4000mg/30ml bottle.